Rice & Peas Soup with Parmesan Cheese makes good use of leftover ham. After enjoying a spread of Classic Baked Ham you may wonder “What to do with ham leftovers?” (If you have any) You can chop the cooked ham for future use in omelets or scrambled eggs, casseroles or with pasta. Once the meaty portions are gone, you can freeze the ham bone to use to flavor greens, dry beans or field peas. 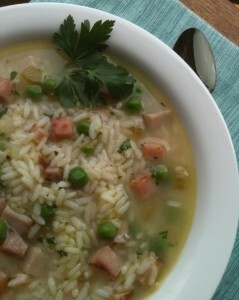 You can also make a light soup such as Rice & Peas with Ham and Parmesan Cheese. This recipe was inspired by one that a colleague shared when I was a food editor at Southern Living magazine. The traditional recipe known as Risi e Bisi (Ree c b c) is a classic Italian soup that is thicker and creamier than my version. My riff on the classic is light, yet filling. It is simple and easy to make, putting extra ham to good use in a savory dish that’s steps above the sandwich solution. In 4-qt. Dutch oven, sauté onion, celery and garlic in olive oil over medium heat 5 minutes or until vegetables are tender. Stir in wine and boil 5 minutes or until it almost evaporates. Add the broth and bring to a boil. Reduce heat to medium low; simmer 10 minutes. NOTE: If reheating, add additional broth, if needed. Great idea to write about an ole favorite – Ham! It real does add nice savory flavor. Thanks. Thanks for your feedback. It is great to keep in the freezer to add to soups, casseroles, eggs and more.